The built-in trackpad on MacBook Pro and MacBook functions as the primary input method of the Apple laptops, but if you primarily use an external mouse or external trackpad you may occasionally find the built-in trackpad receives input you’d rather the Mac ignore. With a simple settings adjustment you can do exactly that, ignoring any input from the internal built-in trackpad when an external mouse or trackpad is connected to the Mac. This applies to any MacBook, MacBook Air, or MacBook Pro. Macs without a built-in trackpad will not have this feature. Changes take effect immediately, any external connected mouse whether through Bluetooth or USB will now cause the internal trackpad on a MacBook, macBook Air, or MacBook Pro to be ignored while those external devices are in use and connected. This can be a great feature for many users for a variety of users, but particularly for Mac owners who don’t use the internal trackpad when an external device is connected anyway. Or perhaps your cat or monkey frequently crawls around on your desk and paws at your trackpad, it would ignore that as well as long as an external pointing device is attached and in use. Aside from the obvious uses of this as a feature, it can also sometimes function as a reasonable troubleshooting trick if you find that you’re often unable to click because of interference between two different input devices, or you are experiencing other weird cursor and click activity and mouse behavior. If you have enabled this feature and find it not to be useful, just disable it again through the same settings by unchecking the “Ignore built-in trackpad” option. 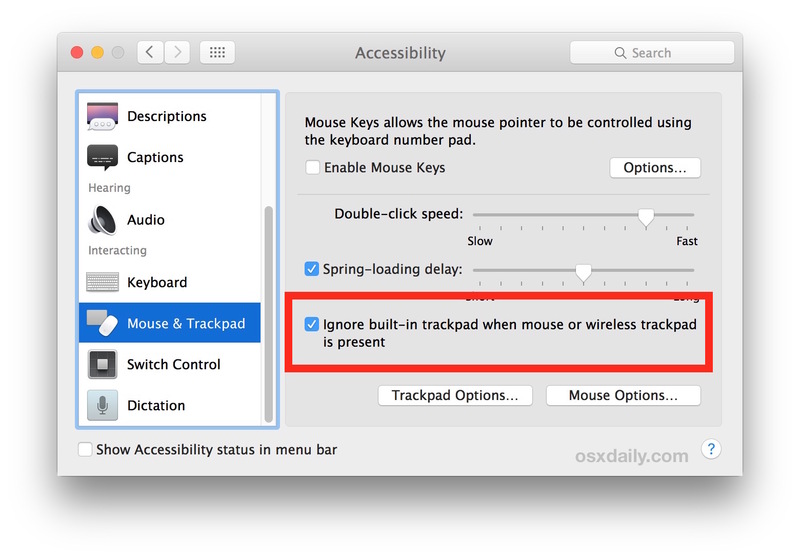 Similarly, if you find that your internal trackpad is not working seemingly out of the blue while you have an external mouse or trackpad connected to the Mac, check for this setting to see if it’s enabled, that’s probably the reason why. I use a bluetooth Apple mouse. When I wake or start-up my 15″MacBook Pro Retina “confuser”, I have to do this every single time. If I accidentally hit sleep mode by going to the corner which enables it and then have to wake my computer again – once again I have to go through the above procedure. It has never carried over from one wake state to the next. Is there a way to make it permanent? Would love to know. I do not use my track pad at all. Thanks. Many are having problems with this not remaining set after reboot since Sierra. The latest update dos not fix it either. Hopefully the next update will. Unfortunately, if you run an alternate OS (Windows or Linux) there is no way to disable the touchpad when using a mouse. Fortunately most Mac users run Mac OS on their Macs. I am an avid Apple user. After much experience with its external Bluetooth devices, I have settled on using an inexpensive Logitech mouse (with easy-to-use USB dongle) as my external tracking device with my MacBook Pro. It’s much more stable than Magic Mouse with no loss of function. The dongle can be used to connect an external Logic (Mac-specific) keyboard at the same time as the mouse, for those who might require a bit more keyboard functionality in a work setting. This DOES NOT work on new MacBook Pro 2018 (USB-C) when using a Bluetooth mouse, I’m using Logitech MX Anywhere 2S and while is doesn’t disable TrackPad it also disconnect once every 3-4 hour for 15 seconds, and every 1-2 days it totally disconnect and only reconnect restore Bluetooth mouse control. Experiencing the same problem with the same mouse.